David W. Hoyt, The old families of Salisbury and Amesbury Massachusetts : with some related families of Newbury, Haverhill, Ipswich, and Hampton, and of York County, Maine / David W. Hoyt., , at https://archive.org/stream/cu31924025963772 . Providence, R. I.: Snow & Farnham, (1897) , pp. 65-66. William Richard Cutter, Genealogical and personal memoirs relating to the families of Boston and eastern Massachusetts, New York: Lewis historical Pub. Co., (1908) , p. 352. Ezra S. Stearns and William F. Witcher and Edward E. Parker, Genealogical and family history of the state of New Hampshire, Vol. 2, , at https://books.google.com/books?id=cfoI0UIOCKQC . New York and Chicago: Lewis Publishing Company, (1908) , p. 616. David W. Hoyt, The old families of Salisbury and Amesbury Massachusetts : with some related families of Newbury, Haverhill, Ipswich, and Hampton, and of York County, Maine / David W. Hoyt., , at https://archive.org/stream/cu31924025963772 . Providence, R. I.: Snow & Farnham, (1897) , p. 304. Vital records of Amesbury, Massachusetts to the end of the year 1849, , at https://archive.org/details/vitalrecordsofam00ames . Topsfield, Mass. : Topsfield Historical Society, (1913) , p. 525. Vital records of Amesbury, Massachusetts to the end of the year 1849, , at https://archive.org/details/vitalrecordsofam00ames . Topsfield, Mass. : Topsfield Historical Society, (1913) , p. 33. David W. Hoyt, The old families of Salisbury and Amesbury Massachusetts : with some related families of Newbury, Haverhill, Ipswich, and Hampton, and of York County, Maine / David W. Hoyt., , at https://archive.org/stream/cu31924025963772 . Providence, R. I.: Snow & Farnham, (1897) , p. 624-625. Henry Blaisdell was born perhaps about 1680. Vital records of Amesbury, Massachusetts to the end of the year 1849, , at https://archive.org/details/vitalrecordsofam00ames . Topsfield, Mass. : Topsfield Historical Society, (1913) , p. 37. David W. Hoyt, The old families of Salisbury and Amesbury Massachusetts : with some related families of Newbury, Haverhill, Ipswich, and Hampton, and of York County, Maine / David W. Hoyt., Vol. 2, , at https://archive.org/stream/oldfamiliesofsal02hoyt . Providence, R. I.: Snow & Farnham, (1897) , p. 634. Blaisdell Papers, Vol. 6, , at https://books.google.com/books?id=D0g2AAAAMAAJ . Blaisdell Family Association, (1961) , pp. 84-5. Vital records of Amesbury, Massachusetts to the end of the year 1849, , at https://archive.org/details/vitalrecordsofam00ames . Topsfield, Mass. : Topsfield Historical Society, (1913) , p. 383. Vital records of Amesbury, Massachusetts to the end of the year 1849, , at https://archive.org/details/vitalrecordsofam00ames . Topsfield, Mass. : Topsfield Historical Society, (1913) , p. 34. Vital records of Amesbury, Massachusetts to the end of the year 1849, , at https://archive.org/details/vitalrecordsofam00ames . Topsfield, Mass. : Topsfield Historical Society, (1913) , p. 285. Philip Challis and Hamline E. Robinson, Symon, Indian : a letter, written at Amesbury, Mass., 9: 5mo: 1677, , at https://archive.org/stream/symonindianlette00chal . Maryville, Missoura: (1903) , p. 10. Vital records of Amesbury, Massachusetts to the end of the year 1849, , at https://archive.org/details/vitalrecordsofam00ames . Topsfield, Mass. : Topsfield Historical Society, (1913) , p. 39. Vital records of Amesbury, Massachusetts to the end of the year 1849, , at https://archive.org/details/vitalrecordsofam00ames . Topsfield, Mass. : Topsfield Historical Society, (1913) , p. 288. Vital records of Amesbury, Massachusetts to the end of the year 1849, , at https://archive.org/details/vitalrecordsofam00ames . Topsfield, Mass. : Topsfield Historical Society, (1913) , p. 35. Vital records of Amesbury, Massachusetts to the end of the year 1849, , at https://archive.org/details/vitalrecordsofam00ames . Topsfield, Mass. : Topsfield Historical Society, (1913) , p. 36. David W. Hoyt, The old families of Salisbury and Amesbury Massachusetts : with some related families of Newbury, Haverhill, Ipswich, and Hampton, and of York County, Maine / David W. Hoyt., , at https://archive.org/stream/cu31924025963772 . Providence, R. I.: Snow & Farnham, (1897) , p. 622. George Byron Merrick, Genealogy of the Merrick–Mirick–Myrick Family of Massachusetts 1636-1902, , at https://books.google.com/books?id=v-XuAgAAQBAJ . Madison, Wis.: Tracy Gibbs & Co., (1902) , p. 148. 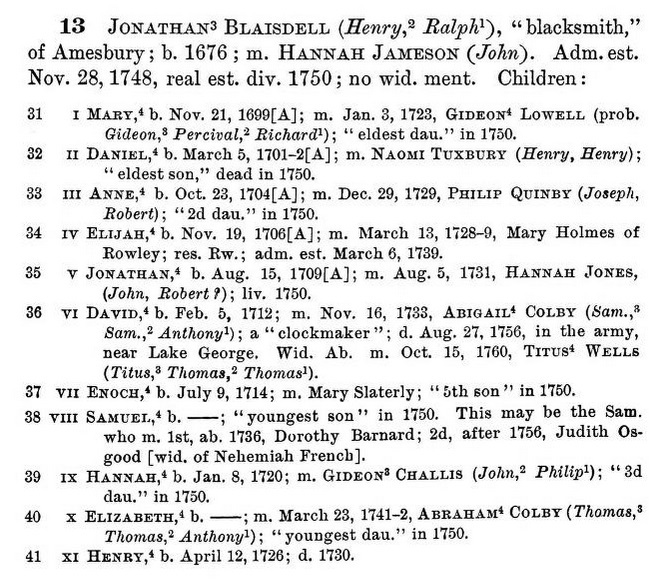 "New Hampshire Births and Christenings, 1714-1904," database, FamilySearch (https://familysearch.org/ark:/61903/1:1:FDJ7-23T : 12 December 2014), Elijah Blasdell, 06 Dec 1759; citing HOPKINTON TWP,MERRIMACK,NEW HAMPSHIRE; FHL microfilm 1,000,483. "New Hampshire Birth Records, Early to 1900," database with images, FamilySearch (https://familysearch.org/ark:/61903/1:1:FLL9-W4Z : 12 December 2014), Mahitabel Blasdell, 18 Dec 1760; citing Hopkinton, Hillsborough, New Hampshire, United States, Bureau of Vital Records and Health Statistics, Concord; FHL microfilm 1,000,483. "New Hampshire Birth Records, Early to 1900," database with images, FamilySearch (https://familysearch.org/ark:/61903/1:1:FLL9-W4G : 12 December 2014), Mary Blasdell, 30 Jul 1763; citing Hopkinton, Hillsborough, New Hampshire, United States, Bureau of Vital Records and Health Statistics, Concord; FHL microfilm 1,000,483. 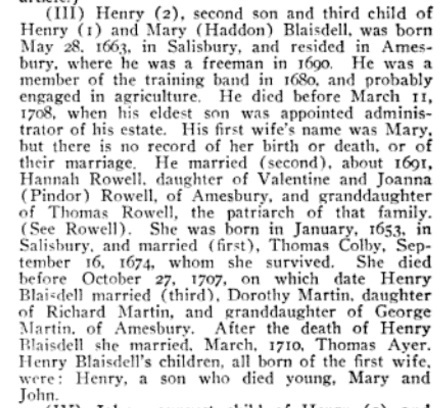 "New Hampshire Birth Records, Early to 1900," database with images, FamilySearch (https://familysearch.org/ark:/61903/1:1:FLL9-WLC : 12 December 2014), Ole Blasdell, 15 Sep 1765; citing Hopkinton, Hillsborough, New Hampshire, United States, Bureau of Vital Records and Health Statistics, Concord; FHL microfilm 1,000,483. "New Hampshire Birth Records, Early to 1900," database with images, FamilySearch (https://familysearch.org/ark:/61903/1:1:FLL9-44W : 12 December 2014), Susanna Blasdell, 08 Jan 1768; citing Hopkinton, Hillsborough, New Hampshire, United States, Bureau of Vital Records and Health Statistics, Concord; FHL microfilm 1,000,483. "New Hampshire Birth Records, Early to 1900," database with images, FamilySearch (https://familysearch.org/ark:/61903/1:1:FLL9-QH3 : 12 December 2014), Abigail Blaisdell, 20 Jun 1770; citing Hopkinton, Hillsborough, New Hampshire, United States, Bureau of Vital Records and Health Statistics, Concord; FHL microfilm 1,000,483. 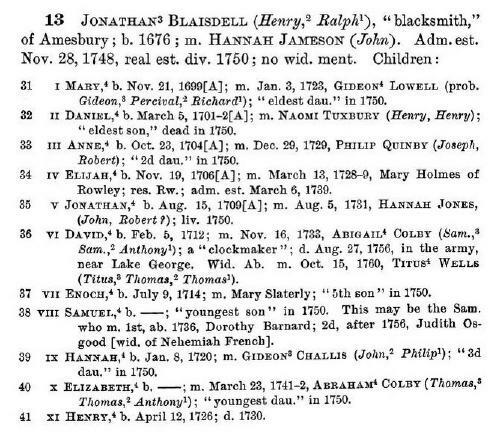 "New Hampshire Birth Records, Early to 1900," database with images, FamilySearch (https://familysearch.org/ark:/61903/1:1:FLL9-4W5 : 12 December 2014), Sarah Blaisdell, 28 Jan 1773; citing Hopkinton, Hillsborough, New Hampshire, United States, Bureau of Vital Records and Health Statistics, Concord; FHL microfilm 1,000,483. "New Hampshire Birth Records, Early to 1900," database with images, FamilySearch (https://familysearch.org/ark:/61903/1:1:FLL9-QHD : 12 December 2014), Bette Blaisdell, 17 Oct 1778; citing Hopkinton, Hillsborough, New Hampshire, United States, Bureau of Vital Records and Health Statistics, Concord; FHL microfilm 1,000,483. Vital records of Amesbury, Massachusetts to the end of the year 1849, , at https://archive.org/details/vitalrecordsofam00ames . Topsfield, Mass. : Topsfield Historical Society, (1913) , p. 287. He was the son of Henry Blaisdell and Mary Haddon. Ezra S. Stearns and William F. Witcher and Edward E. Parker, Genealogical and family history of the state of New Hampshire, New York and Chicago: Lewis Publishing Company, (1908) , Vol. 4, p. 2028. E. O. Jameson, The Jamesons in America. 1647-1900 genealogical records and memoranda, , at https://archive.org/details/jamesonsinameric00jame . Boston, Concord, N. H: Rumford Press, (1901) , p. 2. E. O. Jameson, The Jamesons in America. 1647-1900 genealogical records and memoranda, , at https://archive.org/details/jamesonsinameric00jame . Boston, Concord, N. H: Rumford Press, (1901) , p. 5.